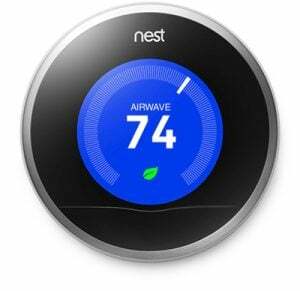 Increase your home’s comfort and decrease energy costs by purchasing a third generation Nest thermostat. This thermostat learns your family’s temperature habits to better create a comfortable environment with automated programming. Nest has saved its customers up to 12% in heating costs and 15% in cooling costs every year. The new, sleeker design makes it a must have for design and function-cautious home buyers. Learns your programming behavior and automates your habits. Easily controlled by phone, tablet, or computer. Sends alerts to your phone if home becomes too hot or cold. Leaf setting guides you to more energy efficient temperature options, if desired. Allows you to track energy use/savings on your mobile device. Uses “farsight” detect when you enter the room and illuminate. Understands your HVAC system and weather patterns to maintain your desired temperature. Turns itself down to conserve energy when it senses you are away. Compatible with other Nest and Google products. Love your Nest? Also consider purchasing Nest Protect, a smart home carbon monoxide and smoke detector that can help ensure the safety of your family. Nest Protect can communicate with your Nest thermostat to turn off the heat in the event of a CO leak and even turn off the fan in the event of smoke detection. Learn more about Nest by visiting their website or contacting us today to learn how you can get a free Nest thermostat installed!